HARARE, Zimbabwe (UMNS)–Peter Anota swerves his rickety bicycle as he negotiates his way in the dusty, makeshift road littered with rocks and other debris. His ride in this neighborhood of Harare, Zimbabwe’s capital is punctuated by a few stops as he balances the delicate act of caring for the sick while ensuring that he earns a living. “I repair televisions and radios in the community and use my bicycle for business and voluntary caring for those affected and infected by HIV/AIDS,” he explained. Anota, 38, is one of 31 volunteer caregivers in the mobile Wesley Clinic run by The United Methodist Church in the densely populated and impoverished suburb of Epworth. Volunteers provide relief for HIV/AIDS patients through counseling, support and palliative care for those who are not mobile. Support also is given to affected families, orphans and vulnerable children. While the volunteer caregivers are mainly women, 12 men recently were trained after it became clear male patients were not comfortable being cared for by women. “The sick men would not freely discuss their concerns with the female caregivers, so we decided to train male carers,” says Irene Mapedzamombe, the nurse in charge of the program. Anota said he is not paid for the service he provides Epworth residents and is on friendly terms with all the patients under his care. His wife supports his efforts and at times reminds him when he is supposed to attend meetings. “I have five patients whom I visit at least twice a week and am proud of the work I do. Some patients were bedridden when they first came into my care, but now they are better,” he said. He looked up into the cloudless sky as he talked with difficulty. “Sometimes the patient dies and I have the difficult task of providing bereavement counseling,” he explained. Another volunteer, Rosemary Manene, 62, sits at the dusty entrance of the unfinished DomboraMwari United Methodist Church sanctuary. All around her, the sandy ground stretches without any sign of life. Her bleak eyes stare unseeingly into the horizon and she nervously hugs herself as she struggles to tell her story. “My work is difficult because I have nothing to give them. At times, I am compelled to take a little maize meal from my home in order to make a little porridge for their sustenance. I am not a rich person, but love forces me to do that,” she said. “When a patient dies, they become my burden. The community says I should provide a decent burial for anyone in my care that passes on. Society will say your person has died, now bury them,” she added. 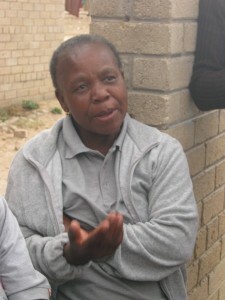 Manene is the longest-serving pioneer of the group; she started home-based care in 1985. “I don’t get any financial or material gain from this work,” Manene said. Compounding the colossal task of caring for 350 HIV/AIDS patients is malaria, which stalks the community and recently claimed the life of a volunteer, Chipo Chese, 40, who was HIV-positive. “HIV is challenging but malaria, which is easy to prevent and cure, has a deadly impact and our patients usually die of malaria instead of HIV-related illnesses,” Mapedzamombe said. Chese had gone to a rural village some 150 kilometers east of Harare, which is a known malaria area, and when she returned was complaining of headache and vomiting. Mapedzamombe said her group educates residents to get medical treatment immediately if they don’t feel well. “Chese was a sad loss because she had an acute malaria attack and died on the same day,” Mapedzamombe said. Epworth is an informal settlement with no established garbage collection structure. It is this situation that has compounded the malaria pandemic. “There are no refuse bins and most people live in damp swampy areas where there are a lot of mosquitoes,” said Mapedzamombe. The fight against malaria is not gaining much ground since the volunteers do not have insecticide sprays. Mosquito nets, when donated, are not enough for the million people believed to live in Epworth. All they can do is educate residents to crush bottles, bury garbage and ensure that any pools of stagnant water are filled with soil. When hearing of the Wesley Mobile Clinic, one pictures a caravan or other vehicle loaded with medical supplies and trekking its way around this poor community. This is not the reality. Run by the Harare East District since 2002, the clinic is made up of Mapedzamombe, the 31 volunteers and meager resources donated by the district, the United Methodist Committee on Relief and Board of Global Ministries, United States Agency for International Development and Zimbabwe Orphans Endeavour. Mapedzamombe commutes the 20-kilometer trip using public transportation, carrying the painkillers and multivitamin tablets she receives from well-wishers. Her main challenge is to provide the materials required by caregivers, which include towels for bathing, gloves and masks for their protection and water buckets. 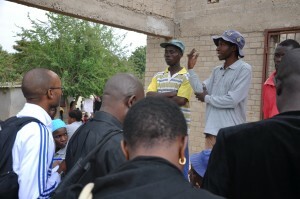 The meeting place for the Wesley clinic is DomboraMwari United Methodist Church. It is here that Mapedzamombe and the volunteers gather to compare notes and share their experiences. The sanctuary has no floors and windows and still is being built with assistance from the Harare East District. The director of connectional ministries for the United Methodist Harare East District, the Rev. Andrew Mupfawa, said the clinic was created a decade ago as part of the church’s mission work for people living with HIV/AIDS. “UMC is the leader of all home-based care programs in Epworth and works in collaboration with Zimbabwe government’s District AIDS Coordinating Committee,” he said. Mapedzamombe says her clinic has had a major impact on the local community and believes more people are going for voluntary HIV counselling and testing at the center run by Medicins Sans Frontiers at Epworth Poly Clinic because of the education campaign. While the major challenge is the lack of resources, the high level of dedication and love in the caregivers is evident. It is this compassion that has enabled them to endure the hardships while providing relief for their infected and affected neighbors, at times digging into their own meager baskets to provide a basic meal for the sick. For Anota and his 30 colleagues, the seemingly overwhelming task of caring for the sick while lacking resources and equipment to use in their mission is no deterrent. Eveline Chikwanah is a communicator from East Zimbabwe Annual Conference of The United Methodist Church. This article originally appeared on the UMCConversations Blog and can be found in its original form here.